This past Thursday on July 22nd 2010, an unexpected concert brought people from the bluegrass region to the Lexington Opera House for a benefit concert. The concert “Appalachian Voices” raised funds and awareness to people on the issue of mountain top removal which is an economic, cultural, and social problem in the coal mining states. 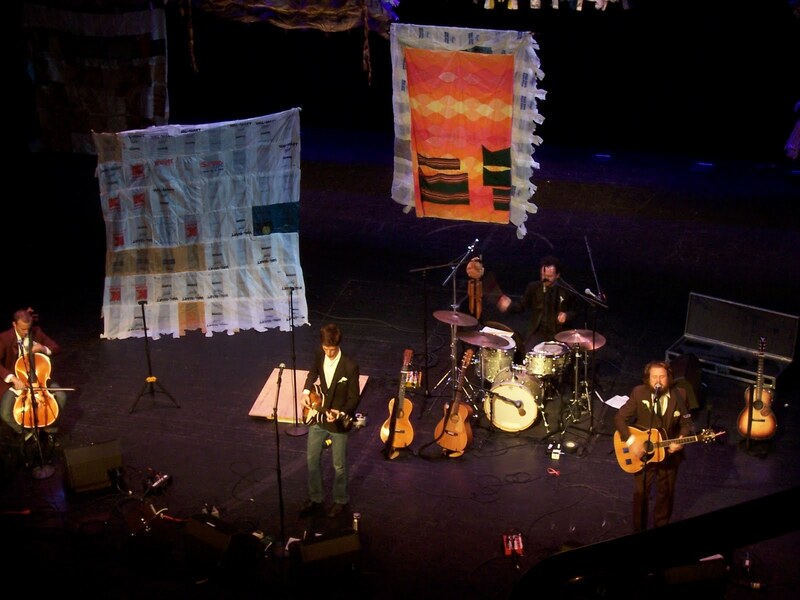 On stage, were quilts made of plastic bags. Ben Sollee, a cellist (who I played in orchestra with in high school! ), explained they were made by a local artist who helps people with disabilities make art. The concert began at 8:20pm; everyone clapped as they strutted onto stage and the lights dimmed. The night was filled with an eclectic mix of songs, some from their just released album, “Dear Companion“, to songs by My Morning Jacket (Jim James, lead Singer), solo songs by Sollee (Cellist & Singer) and Moore (Guitarist & Singer), and even seemingly random songs such as “Save the Last Dance For Me” done in a Latino beat. The drummer, Dan Dorff, joined the trio. Dorff showed off his beats in one song by performing as the drum kit himself, dancing on a plywood board, kicking and clapping the beat. The untraditional group had an amazingly full sound and could have even played in a larger venue to unleash their full sound. Ben Sollee sounds himself a full band on his cello, using his technique to fill in bass, melody, and everything in between. The crowd cheered for the the quartet as the night went on, even throughout two encores. The concert ended near 10:30 as I anticipated the group was ready for a night out around Lexington.